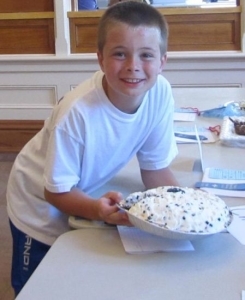 The cooking contest is a fun part of the Blueberry Festival tradition. 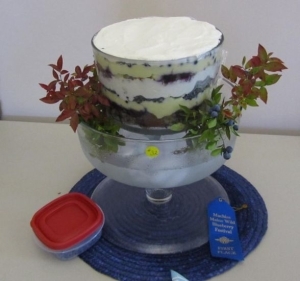 People of all ages enter their favorite blueberry creations in the following categories: Appetizers, Breads, Rolls & Muffins, Coffee Cakes, Dessert Cakes, Cookies, Bars & Squares, Doughnuts, Desserts & Puddings, Jams & Jellies, Pancakes & Waffles, One-Crust Pies, Two-Crust Pies, Salads, Punch & Wines, Relishes, Entrees, and Sugar-Free recipes. Entries must be made from scratch. Cooks include the recipes with their entries, but do not have their names visible. Cooking contest entries are accepted on Friday at the Machias Savings Bank Community Room from 9 am – 11 am. Judging is Friday from 11-3 p.m. and winners will be announced at 6 p.m. at the Fish Fry. Judges for the 2019 Contest: To be announced. The Wild Blueberry Commission of Maine awards prizes for the best overall entry, and for the best two-crust pie. 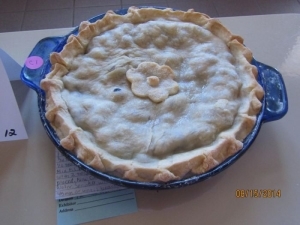 The pie winner is also invited to participate in the pie contest at the Blue Hill Fair. Two children’s awards are given for the best entries by a boy and a girl. Prizes this year are as follows: overall winner, $100; best two-crust pie winner, $100; boy and girl winners, $50. Click here to download the Cooking Contest Entry Form.